Do This, Burn Fat - 101 Sneaky, yet SIMPLE, Weight Loss Tricks to Burn Fat FAST! It’s about unlocking and using your body’s 'secret' tricks to help you win the unfair battle you fight with your stubborn fat. Trick #76 - The "high-low trick": A 2-step tactic to get rid of embarrassing chest fat for good! Trick #73 - The "vacuum trick": No, it has nothing to do with lyposuction...but it could strip as much as 1 full inch from your waist in just 30 days! Trick #9 - The "post workout fat melting elixir": This drink has been used for over 4,000 years, but only recently has it also been discovered to BOOST your body's ability to burn fat , especially after a workout (and no... it's not a supplement). Over the last 10 plus years, between the two of us, Jeff and I have helped thousands upon thousands of people lose weight (it’s actually too many to give an accurate count because we’ve sold well over 1 million weight loss programs between the two of us). … Some “only” lost a couple inches off their waist, and others lost over 10. And quite honestly, some folks struggled, and some never saw any positive results. ... Many clients transformed their bodies and lives, as if by magic. Others always struggled. Struggled with the workouts, or didn’t stick with the diet, which means they may have lost weight, but it always came back, and they usually felt horrible. They became depressed, their bodies aged rapidly and they felt like losers. Did the people who struggled have something wrong with them? Were they destined to remain fat, with no energy, while also aging rapidly? Were the people that succeeded better? Did they have secret powers or better genes or some sort of magical metabolism that helped them almost effortlessly lose weight? You're about to discover an amazing collection of the FASTEST , most EFFECTIVE (and sometimes weird) fat-burning, energy-boosting, and age-fighting tricks used to help our clients achieve amazing results in record time! They did the work, sweat, and paid THOUSANDS of dollars to discover these tricks, but you get to reap the benefit and reward! Pick 1 or 2 tricks that feel good to you, and look like they can fit into your current lifestyle. Follow those 1 or 2 tricks until you're done - sometimes as little as a day, other times it takes a couple weeks, and some you will use forever because they just feel so good. Once you're ready, pick 1 or 2 more and repeat. It really only takes 1 or 2 SMALL CHANGES to DRAMATICALLY change the way your body looks! That's it! Just a few tweaks to the way you eat or the way you remain active during the day and that excess fat that's been frustratingly holding on for dear life suddenly "gives up" and melts off your body day after day! 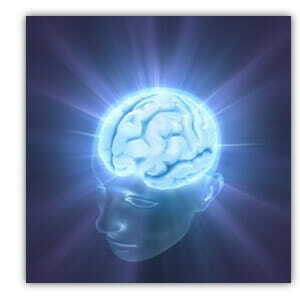 ...And AMAZING SUCCESS With Your Body, Mind, & Energy! 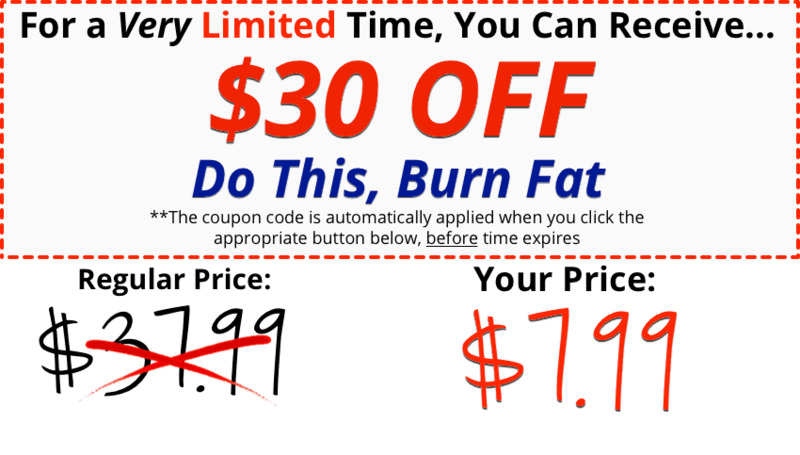 THAT'S what "Do This, Burn Fat: 101 Sneaky Weight Loss Tricks " offers you! In fact, you'll laugh out loud at how crazy some of these "quick tips" sound...but you can't argue with science and each one of these strategies is backed by hard evidence of their effectiveness at helping you take control over the excess fat you've built up! It's all available right now as an instant download and you can listen in as I quickly layout the simple techniques you can put to use right away tor fine-tune your nutrition, kick up your metabolism, and enjoy skyrocketing motivation! "Sneaky Food Tricks" That Will Make You Feel Like You're CHEATING When You're Actually Melting Through Fat Like A Hot Knife Through Butter! Losing weight never tasted so good! In fact, with these underhanded food strategies, you'll never use the word "diet" again! This miracle spice is good old, tasty Cinnamon ! Cinnamon is proven to have dozens of health benefits, the main benefit that will help you to get leaner is through it's strong effect on controlling blood sugar levels in your body. … meaning you’ll stop storing excess calories as fat, control your appetite, and stop craving high sugar, or other carbohydrate rich foods. This magical little spice really is a wonder at helping your body control how it stores, and burns, fat. Trick #1: The simple twist to your morning routine that INSTANTLY jumpstarts your metabolism and boosts fat-burning by as much as 30%! 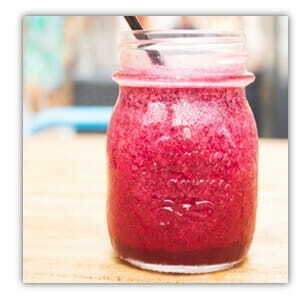 Trick #5 : The beverage you've been WARNED to stay away from...but new-found studies reveal the shocking health benefits jam packed in this potent anti-aging/fat-burning "elixer"! Trick #15: The amazing "super food" that in one clinical study, dissolved away more than 10 extra pounds in twelve weeks...WITHOUT DIETING or any other lifestyle changes! Trick #10: Alcohol and fat loss?! Yep, it's true! You really can enjoy some alcohol AND still lose weight... but you must follow this trick exactly , because alcohol can be very tricky when trying to lose weight. Trick #16: Eat this delicious "super food" and not only boost your metabolism, but also control blood sugar, improve the health of your joints and skin, satisfy your appetite, and help control your blood pressure! "Sneaky Exercise Tricks" That Put An End To Gut-Wrenching Workouts And Reveal How To Burn MORE Fat With LESS Effort Than Ever Before! 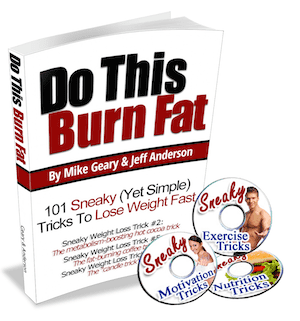 The fact is, there are "sneaky" little ways you can burn extra calories all day long that you've never thought of yet have proven to be incredibly effective at destroying body fat to help you lose more and more weight every single day! Amazing (and Sneaky) Stomach Shrinking Trick... It’s strange… but really does work! You're going to love the simplicity of this trick , and even how strange it is… but don’t let the fact that it’s easy fool you into believing it’s “too good to be true” because it can absolutely work! It’s very important to note that this specific trick helps you to FLATTEN your stomach by strengthening your deep abdominal muscles and hence "pulling in" a lazy stomach (aka beer belly or "pooch belly”). It may sound strange, but many people’s “deep abs” are extremely weak, leading them to have a “pooch belly” and by doing this short, 30-second trick daily , you can actually PULL in your stomach, causing it to FLATTEN out, thus shrinking your waist! I find it a good time to get in the habit of doing daily ab vacuums while driving on your daily commute or another time that would get you in the habit of doing them regularly. Of course, ab vacuums can be done anywhere and at anytime and don't have to be just for driving, but I've found that it helps me to remember to do them if I do them at a specific time when driving regularly.... this could be while driving home from the gym every time (I do this 3-4x per week while driving home from the gym), or perhaps during your daily commute to work. The great thing is that this crazy simple exercise, when done regularly, can shrink your stomach 1-2 inches - WITHOUT a change to your diet or any type of workout program . It's that effective, and this isn't a crazy infomercial promise either, because the simple act of strengthening these "deep ab" muscles PULLS the surrounding tissue and muscles in, thus shrinking your stomach. How awesome is that?! 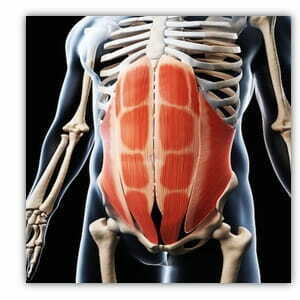 They even help to strengthen your core and support a healthy back! You can do them standing, seated (such as in a car), kneeling in a four-point position, or even lying flat on the floor. I prefer them seated or standing. The movement is as simple as pulling your belly button in as far as you can by imagining you're trying to touch your belly button to your spine and holding for 10-20 seconds at a time. Start by inhaling deeply. Then, as you exhale, start pulling the belly button in towards the spine and hold it there for 10-20 seconds while just taking short breaths. Repeat for several of these 10-20 second holds, perhaps 5-10x if you have enough time while in the car. But even just repeating 3-4x every time you're driving somewhere can really add up over time and give you the benefit of a flatter belly! Trick #57: SHOCKING! Japanese researchers unlocked a strange biological trigger that tricks the brain into REDUCING blood sugar and short-circuiting fat storage ...even WHILE you watch TV! Trick #69: The most overlooked exercise strategy that even the "big boys" at the gym are unaware of...but when YOU use this technique, you'll NATURALLY raise your age-defying, fat melting Growth Hormone levels by as much as 4,000% (No...that is NOT a typo)! Trick #70: I NEVER see anyone using this exercise technique in public but this "mini-workout" is a powerful way to work your muscles for an instant metabolic turbo-boost (works especially well at work)! Trick #74: "Spot-reduce" ab fat? They say it can't be done! Or can it? Give this little training strategy a try and decide for yourself when you look in the mirror just 10 days from now! Trick #51: Don't like the idea of long, drawn out workouts? Neither do I! Give this ultra-simple workout technique a try that cuts your workout time down to just 2 MINUTES! This is especially helpful to do before meals, or if you're feeling "sluggish" throughout the day. Trick #67: The "Booty Tightener": This simple, yet very effective trick helps to tighten, lift, and firm your booty... a body part that makes men drool, and other women envious! Bonus Trick #106: The "Pre Meal" 30-Second Workout! This simple and sneaky little trick does a couple things. First, it boosts your pre-eating metabolism so that you'll burn more of those calories you're consuming (nature's fat burner!). Second, it acts as an appetite suppressant so you won't eat as much during your meal... and you're still working your muscles, so you'll also end up looking leaner, stronger, and more fit. What a great combination... and it only takes 30-seconds! Never again fear the humiliating failure of "trying" a weight loss program and then quitting a few weeks or months down the road! The simple "quick tips" you'll discover in this earth-shaking audio program is all you need to eliminate ANY doubt from your mind that you will completely transform your body, mind, health, and spirit...for good! Trick #82: How a cheap BIRTHDAY CARD can act as your "crystal ball" into the future and help you stay on track with your fat-burning efforts! Trick #90: Don't feel like getting to the gym or your exercise class! 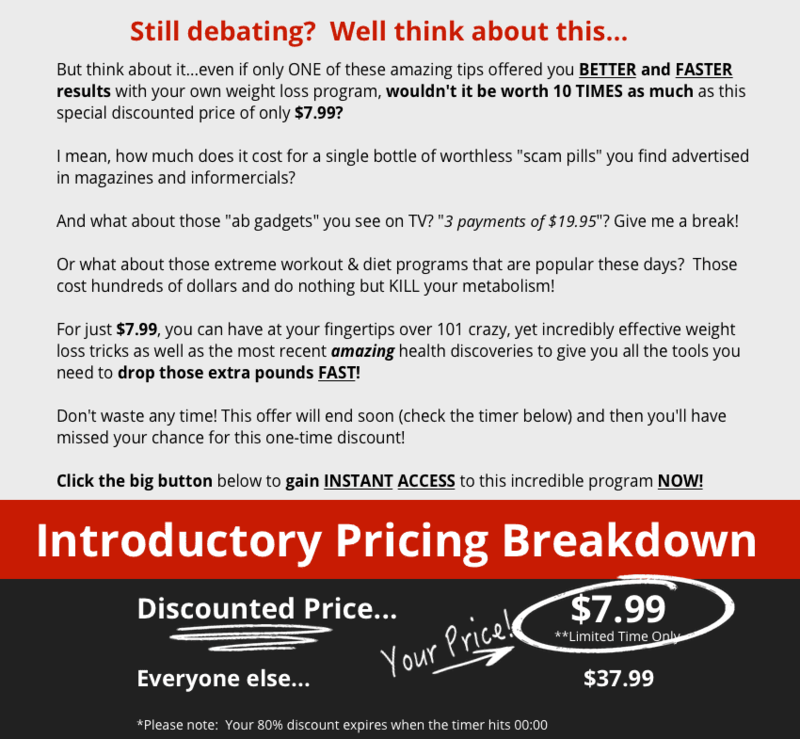 This is THE #1 secret for destroying all of those saved up excuses and even enjoying your workouts more! Trick #94: Stop hiding from your co-workers when they bring donuts or head out for fast food! There's a better way to avoid temptation! Trick #99: A CANDLE that can naturally balance hormones, build muscle, AND burn fat?! It's true! Trick #84: The "Brain Game" This simple little game may go a little "negative," but it is incredibly effective at keeping you motivated and progressing toward your fat loss goal. This is especially effective if you try multiple diets and workout programs in a year, and never stick to any one program. As you can plainly see, even just ONE of these amazing secrets can make a world of difference in your ability to get better and faster results from your weight loss program! Like you’ve just discovered, we compiled over 101 of the easiest, quickest, and downright sneakiest weight loss tricks imaginable. … just simple tips and tricks you can start using TODAY (like 5-minutes from now), to start burning more fat, boosting your metabolism, strengthening muscles, melting away stomach fat, improving your health and fighting the aging process. To make things as easy as possible on you, you’re not only going to receive this simple program in a downloadable pdf (that you can read from your computer or any tablet or mobile device), but you’re also going to receive 3 downloadable mp3’s so you can listen to these tips and tricks! We’ve made this as simple as possible for you to use as a quick reference that you can come back to over and over again, as well as share with your friends, co-workers, family members, and loved ones. Honestly – we want you to share the tips and tricks that you find useful! If one of these tricks gets helps you to finally lose that stubborn weight, stick to your workout program, or keep you motivated to make a permanent lifestyle change, then you should take that information and share it with other people who are struggling. Imagine Having Access To 101 Of The Most Cutting-Edge Weight Loss Tactics To "Sucker Punch" Unwanted Body Fat Once And For All! And just in case, you're thinking that there has to be some sort of "catch", I'll even back up this program's effectiveness with a "can't fail" guarantee! I'm that confident that you're going to be blown away by the simple-yet-powerful breakthrough discoveries from University Research Studies, independent testing organizations, andmedical advances and you lose absolutely NOTHING by giving them a try in your own weight loss program. Trick #9 - The "post workout fat melting elixir": This drink has been used for over 4,000 years, but only recently has it also been discovered to BOOST your body's ability to burn fat , especially after a workout. We look forward to hearing about your results!